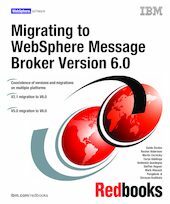 This IBM Redbooks publication will help you to migrate WebSphere MQ Integrator V2.1 and WebSphere Business Integration Message Broker V5.0 to WebSphere Message Broker V6.0. It begins with an overview of the WebSphere Message Broker V6.0 solution, which plays a key role in the integration of disparate applications and platforms by providing functional and transport capabilities to support and facilitate enterprise-level business integration. Then it explains the new features and enhanced capabilities in WebSphere Message Broker V6.0, and describes the migration path from the previous supported versions. The book provides extensive guidance and instruction about the various activities involved in migration including planning, backing up resources, migration steps, verification, coexistence, and restoration. It covers the migration of development resources, Configuration Manager, User Name Server, and brokers on multiple operating systems. It also shows you how to move the Configuration Manager component and development resources to other platforms. The book covers both generic and platform-specific considerations. It also demonstrates the migration process, with the help of coexistence, on several major platforms using two scenarios, one for WebSphere MQ Integrator V2.1 and the other for WebSphere Business Integration Message Broker V5.0. The information included in this book complements but does not replace product documentation.